When the two sisters traveled from France to America with their mother and seven of their siblings in 1854, Elisabeth was seven and Christina was just five years old. Hailing from the Lorraine region of France, both girls spoke German. They both attended church and school in their new hometown of Cincinnati Ohio, and both girls were young when they married older German immigrants. Sadly Elisabeth and Christina also had personal tragedies in common – both experienced the loss of young children. Two of Elisabeth’s children died as toddlers and Christina lost four children under the age of five. 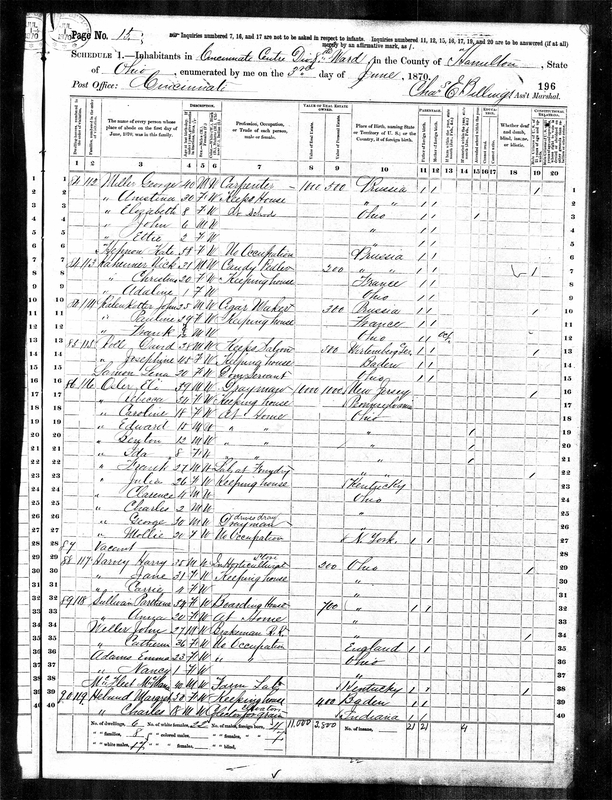 Elisabeth’s personal estate was valued at $600 when the 1870 census was taken, but her husband was not the source of her wealth. She operated a millinery store; the sole support of her family. Christina’s husband was a Civil War veteran who owned a candy store and business. However according to line seven of the 1870 census below, Nikolaus Kirchheimer’s personal estate was valued at less than the economic worth of nearly all his neighbors. 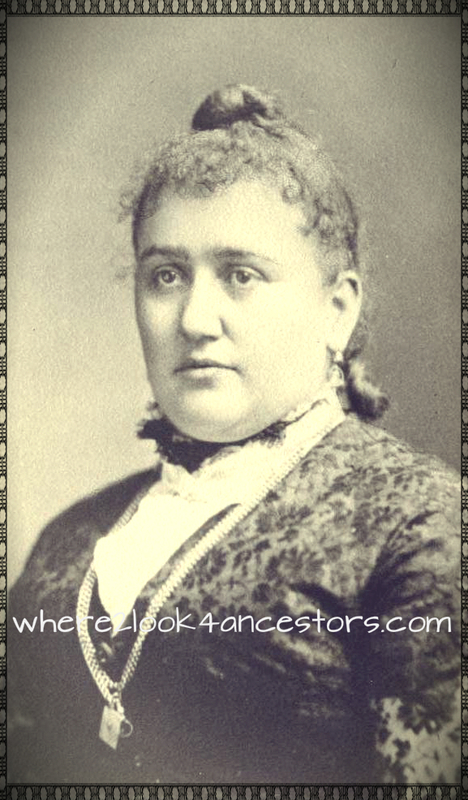 In 1874 an independent Elizabeth moved to Chicago, divorced her alcoholic husband and married a wonderful German-speaking man from Switzerland. She died of diabetes in December of 1901 and is buried with her husband Jacob Mueller at Oak Woods Cemetery in the Englewood neighborhood of Chicago. Christina remained in Cincinnati. She and Nikolaus had a total of nine known children before he died at age 56. Left a widow in 1895 with four children under the age of 12, Christina had no means of support for herself or her family. Thankfully she applied for and received a Civil War pension. It would provide a meager amount, enough to survive until her death at age 61. Born on this day in 1849 in Hellimer, Moselle, Lorraine, France, Christina died in Cincinnati, Ohio February 6, 1911. She is buried with her husband at Spring Grove Cemetery and Arboretum. I was wondering if you may have DNA tested yet? I also have family from the Alsace Lorraine region who immigrated in the 1850’s. Mine settled in Iowa rather than Ohio, and included Kerns, Miller, Kern, and Linden. Thanks for asking – the results haven’t come back yet, but yes – the test has been taken and I’m eagerly awaiting the outcome!